My first proper eyeballing of the bike sees me jotting down two all caps notes in my phone. The first says “TANK IS SMALLER,” (eloquent, I know) and the second, noting something I would ponder at length long after I had to give the keys back, says ‘NO CHROME?’ The side-by-side comparos of the incoming and outgoing models provided by Triumph in the pre-ride meeting confirm my second thought. While the original 60’s models were like a wild party in a mirror ball factory, and the outgoing models had their fair share of shine, this new model literally blacks out everything downstairs bar the cans and headers. The injector covers and headlight unit try to raise the metal quotient, but closer inspection reveals either a matte anodised finish or plastic doing its best chromium impression. While we were told that chrome turns off many owners due to its inherent cost and upkeep, the fact of the matter is that much of what was metal in the previous bike is now plastic. My ‘look like an expert’ tap test revealed that there’s plastic on the engine, too. But don’t get your pitchforks out just yet. Dig a little deeper and you’ll find a few good reasons for this – the foremost being that this is in fact the new range’s base model. 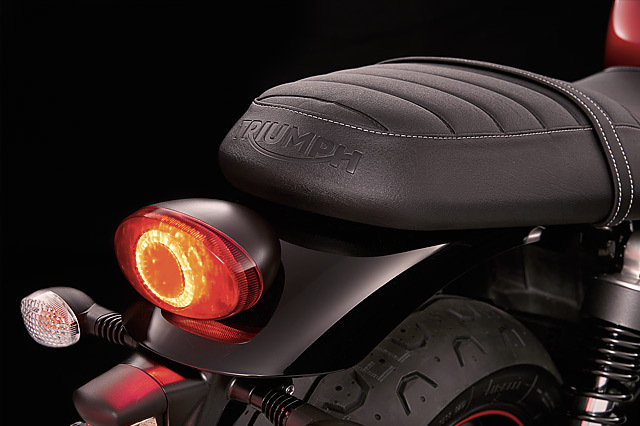 Triumph’s own photos show that the upcoming T120 and Thruxton bin these polymers in favour of much more metal and shine. The other reason is probably a price consideration. The decision to keep the price down and target a younger, more urbane, and probably less experienced rider is a smart one on Triumph’s part. They now get to experience the brand at a much more reasonable price point, and the odd horizontal bike mishap won’t result in any wallet-destroying repair bills. Then there’s that whole ‘tradition’ thing again. While many of us old-ish riders wet our pants and the thought of acres and acres of chrome, it’s probably fair to say that some (presumably younger) customers would turn their noses up at paying for the looks of some bygone era that they neither know of nor care about. 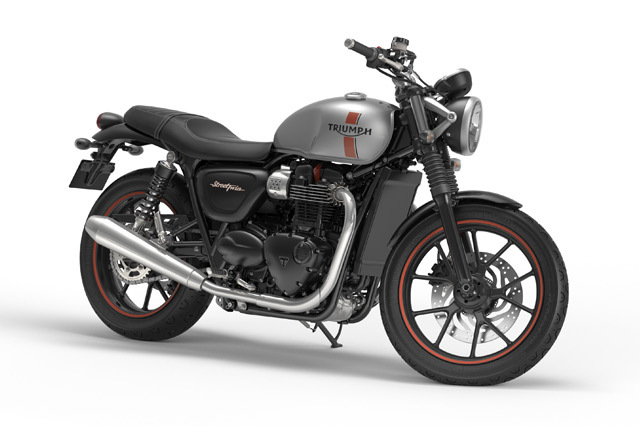 So, as is the trend with many manufacturers, Triumph has elected to shift the majority of the billet into the accessories catalogue. 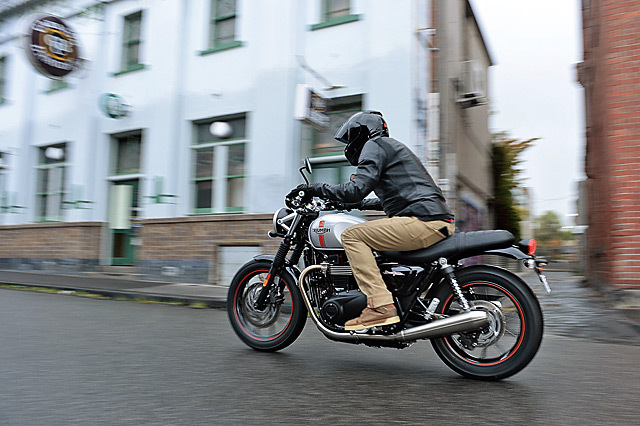 They are ‘styled’ into packs that include a brat, urban and scrambler look. Sadly, none of these include any alternative wheel options. Boo. Indulging yourself here will take a toll on your wallet though – the packs (especially anything that includes new pipes) can set you back another 20% over and above the bike’s ride-away price. 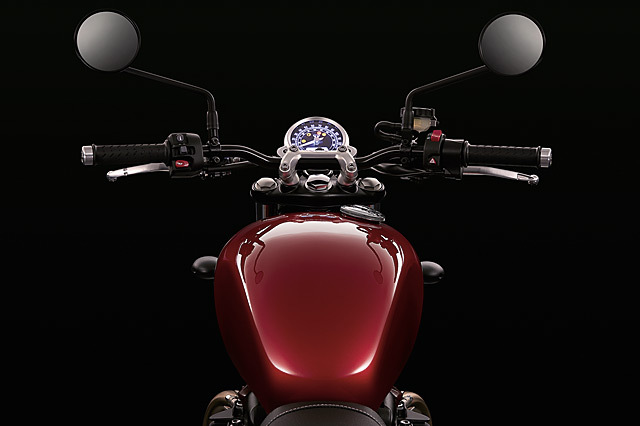 Ironically, it’s the pipes that add the most ‘wow’ to the bike’s somewhat subtle stock looks. While the new Vance & Hines (bye-bye Arrow) peashooters are hard to distinguish from the stock pipes, the newly designed scrambler pipes are real lookers which will appeal to everyone but the legally blind. They also give the bike’s sounds a boost. This was evidenced by the journo’s mad scramble (pun fully intended) to grab this bike’s keys after each and every stop. 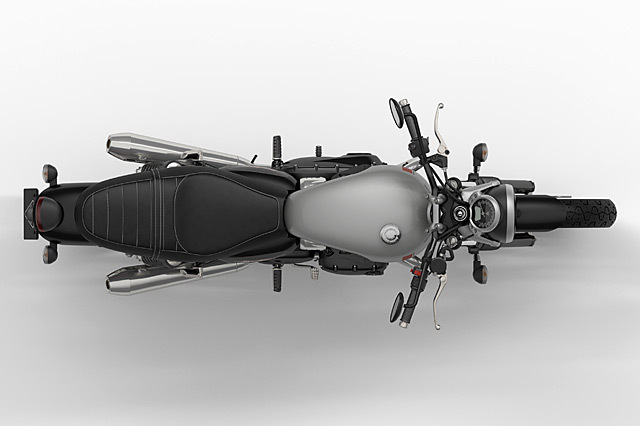 The scrambler pipes sport a carbon fiber tip (see below) that struck me as an odd, and very sportsbike-ish, addition to a design that seems tailored to a completely different crowd. My concerns fade as the sweet, sweet roar of the thing through the enclosed parts of our day’s ride is entered into my brains ‘great bike sounds’ filing cabinet. 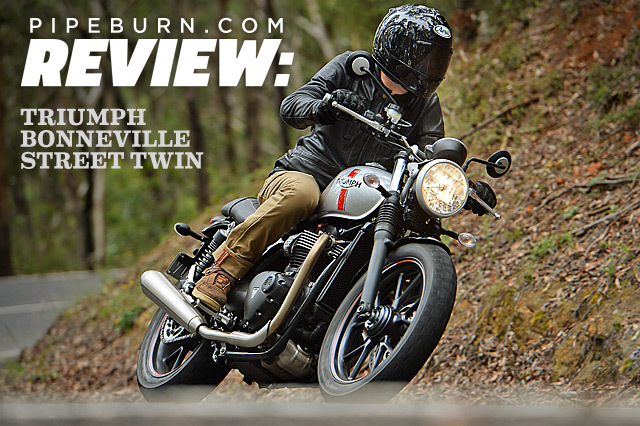 Once the all-new parallel twin lump was ticking over, blipping the throttle provided an interesting insight into the soul of the bike. That’s because it’s here that the new ride-by-wire electronic wizardry is most apparent. There’s an ever-so-slight delay between a twist of the wrist and the engine’s corresponding reaction; it’s only slight but it, combined with the instrument’s slick technical feel, remind you that this ain’t no cable-to-carby set-up from ye olden days. Of course, this observation is probably more to do with ‘the shock of the new’ than anything else, as once we’re out on the road the entire set-up proves to be eminently capable, smooth and without the slightest sign of snatchiness. Amusingly, I wasn’t the only rider on the day that noted the speedo’s needle seemed to waver ever so slightly while riding – almost as if the bike had been programmed by Triumph’s lab-coated boffins to mimic the old-school wobble of its predecessors. These tech updates hit up your ears as well. The mechanical whirl of the motor has lost some of its old-school agriculturalism and now produces that high-pitched, electro-mechanical whine that’s an ever-present feature in most of Triumph’s new work. This is, of course, largely due to the new engine’s tighter, water-cooled tolerances. Thankfully, the 270˚ crank’s character pulls the party back into Funsville with a liberal dose of character and, with the addition of the high pipes, some unexpectedly retro tunes. Weeks later, and on Triumph’s loaner bikes in an open-faced helmet, I also notice there’s also a rather pleasant, bird-like chirp to the sound that’s not dissimilar to the ‘ping’ of an air-cooled VW. After planting my not insignificant backside on the bike a few times, I decided that the rear shocks were compressing a little more than I was expecting. While this didn’t translate to an overly pillowy feel on the road, it’s clear the bike’s tuned for comfort and not ten tenths apex hunting. There was, however, the odd moment or two when an awkward set of bumps would catch the rear shocks off guard. The result was a noticeable kickback through the bike’s rear and into, well, mine. Also noticeable is just how slender the rear half of the bike’s tank is. What ends up between your legs (don’t go there) once onboard is very slender indeed. A quick peek underneath it reveals all sorts of nooks and crannies that steal away space from the petrol for all the bike’s new electrics. The upshot is a 12 litre (3 gal.) tank. This is something that, on paper at least, seems way too small to be practical outside the city. It certainly raised a few journo’s eyebrows when mentioned. The reality is a useful 300km (180 mi.) range, which drops to around 250km (155 mi.) when you try a little ‘spirited riding’ as they say. This is clearly one of the upsides of Triumph having to jump through hoops for the Euro 4 emissions regulations – a more torquey motor than the retired unit that also needs less juice, too. Once the city’s limits have been breached, overtaking happens with a minimum of fuss. A twist of the go stick summons an impressive wave of torque that picks up the bike and pushes it forward, easily consuming the stray family SUV and local tradesman’s ute. There’s absolutely no doubt that this bike has more torque than the previous generation. It’s important to note that the bike is slightly down on power from the old 2015 model, but it manages to surprise us all with its clearly improved get-up-and-go. 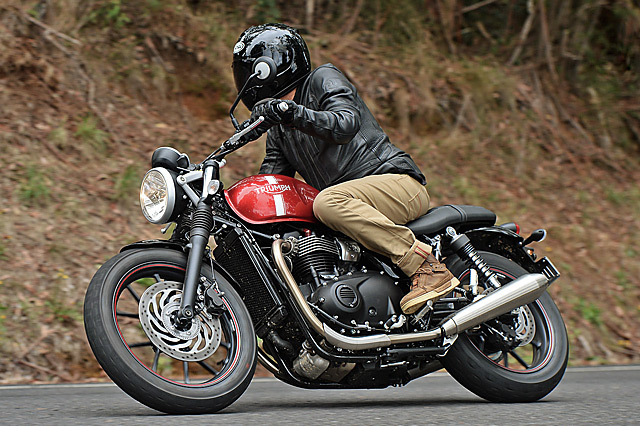 Besides, if it’s face-stretching, reality-blurring power that you really want, the top-shelf Thruxton is much more likely to be you ride of choice. The lack of a tacho and the wealth of low-down torque sees me bounce off the rev limiter earlier in the day until I realise that the engine isn’t one that needs, or likes, to be beaten with the rev stick. The old model showed a much flatter torque curve, which sat at a consistent 60Nm (44 ft lb) throughout its entire rev range. The new power plant improves on this by about 20% up until the 6000rpm mark, after which it drops off quickly. Most of the urge is to be found between 2000 and 4000 revs, which is where the bike and I happily agree to play. For a moment, my mind is drawn away from the bike and to the fact that the rest of the press pack seems to be buggering off. A complete lack of local road knowledge combined with the fact that I’ve been throwing a leg over way too infrequently in the last 12 months brings me to a harsh conclusion. My riding is rusty as all hell. Having a few ex-racers up front doesn’t help things, either. Note to self: all blog and no bike makes Andrew a dull rider. 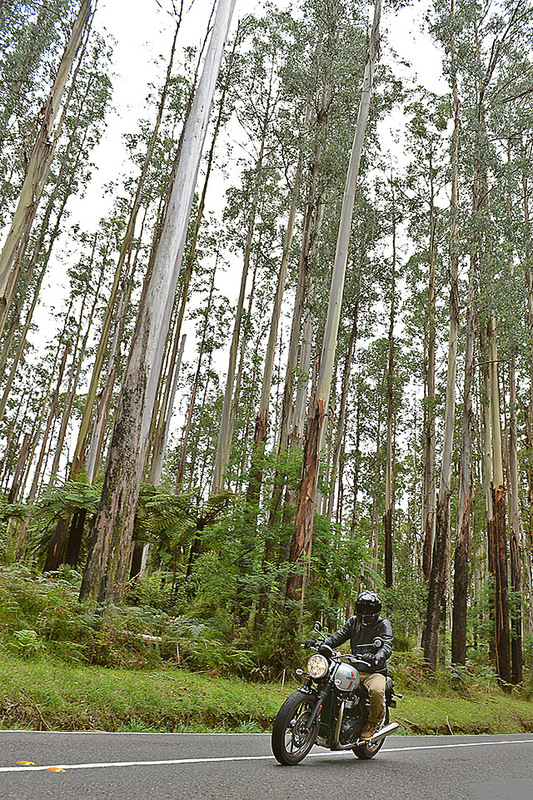 So with the press pack long gone, it was now just the bike, the breathtaking Black Spur forest and little old me. Famous in Australia, the road consists of nothing more than the perfect piece of tarmac weaving its way through a never-ending grove of ancient rainforest ferns and Mountain Ash Eucalyptus. The trees are impossibly tall and my more vivid imaginings turns them into some kind of ancient, rust-stained columns design to keep the sky in place. The bike drinks up the cool forest air and thunders forward through the continually supplied set of on-camber corners using its newly angled crank with glee. This road is often cited as Australia’s best, and today the Bonnie and I are rather inclined to agree. It’s now that it all comes together. As with all good bikes, the Bonnie both shines through and yet never overwhelms the ride. The pipes autograph the experience with a sweet exhaust growl while the rest just happens as you know it should. Everything about the bike is in its right place and there’s pretty much nothing that takes you away from your flight through the forest. And, unwittingly, the man’s hit at the very heart of the bike’s reason for being. When you’re designing something that, by you own company’s words, is “an entry-level model that was inspired by the new wave custom scene”, you’re gonna want something that’s a solid platform to customise on while keeping prices down and younger riders happy. And what could be better than that? 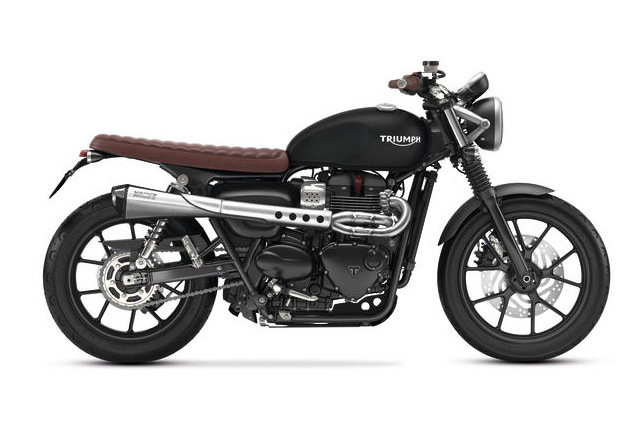 So, while tradition may indeed be part pleasure and part pain, it’s hard not to admire what Triumph’s done to this, the linchpin bike of their entire brand. The Street Twin has emerged as a new bike for a new age of riders while still managing to remind us of everything that’s great about riding motorcycles, whether it be now, or 100 years ago. You really can’t ask for better than that. 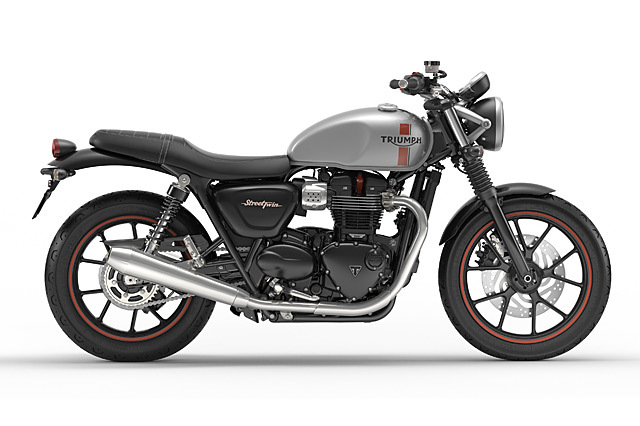 And if the range’s new T120 and Thruxton models follow the same lead, I think we’ll find them just as impressive. Congratulations to Triumph for a job well done. 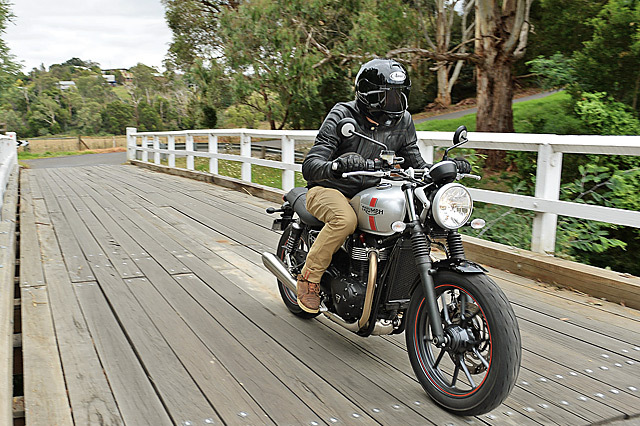 The fine print: In an effort to keep things as legit as possible, we feel it’s best to mention that Triumph Australia paid for our trip to Melbourne to see their new bikes. Rest assured that if the bikes weren’t up to scratch, we’d have no problems in saying just that, and that we will always endeavour to give you guys the best reviews possible without fear or favour; sponsors bearing gifts included.